Terry Hara, deputy chief of the Los Angeles Police Department, announced that he is running for the 9th City Council District. A campaign kickoff will be held on Wednesday, April 25, at Ocean Seafood in Chinatown. 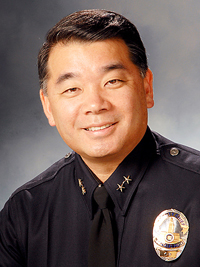 Hara, who joined the LAPD in 1980, is the highest-ranking Asian American in the police department. He is commanding officer of the Personnel and Training Bureau (PTB), and is responsible for overseeing the administration of human resources for the department and the training of police recruits and “in-service training” for both sworn and civilian employees. Hara is also active in the Japanese American community, having served as president of the Nisei Week Foundation and the Japanese American Optimist Club of Los Angeles. He is also a board member for the Japanese Chamber of Commerce of Southern California and the Japan America Society. He recently stepped down from his position as a board member of the Go For Broke Education Center. The 9th District is currently represented by Jan Perry, who is termed out and running for mayor in the citywide election to be held in March 2013. While Little Tokyo has historically been part of the 9th, the neighborhood has been moved into the 14th Council District in the controversial redistricting map approved by the City Council last month. “Irrespective of redistricting, it would be wonderful to represent Little Tokyo as one-fifteenth of the vote on City Council,” said Hara. The new 9th District extends into South Los Angeles and also includes USC and the LA Live/Staples Center complex. Hara has worked in South Los Angeles in the LAPD in the Southeast, Southwest and Newton police stations. His command assignments include Southeast Division and the Detective Support Division where he was in charge of the Bomb Squad, Asian Crime Investigation Section, Fugitive Warrant Section, Special Investigation Section, Criminal Conspiracy Section, FBI taskforce on violent crime, Audit Section, Criminal Investigation Section on counter terrorism, and Career Criminal Apprehension Section. “I would take the same skill set and make sure the city is run in the most efficient manner, least costly way,” said Hara. Assemblymember Mike Davis, vice chair of the California Legislative Black Caucus, has also filed papers to run for CD9. Other declared candidates include business consultant Elaine Gaspard and Charyn Harris, founder of Project MuszED, a nonprofit music education organization. Hara’s wife, Gayle, is a deputy city attorney for the City of Los Angeles, and they have two children, son Mark and daughter Kimberly. He said he consulted with his family before deciding to seek elected office. “The first person I asked was Gayle and she is completely supportive. My son and daughter said, ‘Dad, do it,’” said Hara. If elected, Hara would be only the second Asian American to serve on the City Council, but he said he is planning to run a broad campaign. “I’m running a campaign to appeal to everyone. Hopefully we are beyond racial politics,” Hara said. The kick-off fundraiser for Terry Hara for City Council takes place on Wednesday, April 25 from 6 to 8 p.m. at Ocean Seafood Restaurant, 747 N. Broadway, Los Angeles. To RSVP contact John Tang by April 22 at [email protected] or (626) 300-6620. My event planning company worked with Terry when he was Board of Directors Chair of the Los Angeles Police Museum. He showed extreme capibility as a leader and was precise in his judgement of how he wanted our fund-raising dnnner to look and feel. good judgement is what makes a great political leader. Although we do not live in his district, we are happy to contribute in any way possible to help him achieve his goal as a City Council Member representing the 9th District. The 9th District would be very lucky to have Terry Hara as their councilmember.